Avarua is the capital of the Cook Islands located in the South Pacific to the northeast of New Zealand. More specifically, it lies at an approximate distance of 2100 miles from the north of New Zealand. 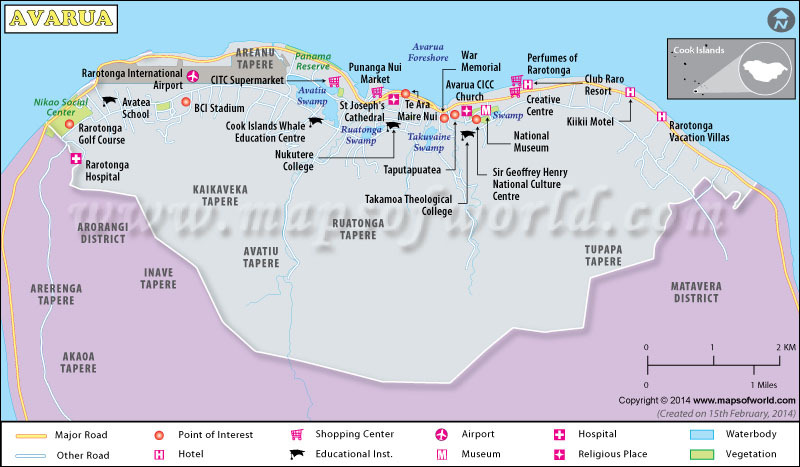 It is the prominent commercial hub and town of Rarotonga. The name Avarua means "two harbors". It is given because the town has two harbors. One is a small harbor within the town while the other is a larger port at Avatiu harbor, located immediately to the west of the city. Located on the coast’s flat area, this town has an approximate population of 3000. The city is also noted for its two famous roads, i.e. Ara Tapu road and the Ara Metua road. The Ara Tapu road circles the island and then passes through the city. On the other hand, the Ara Metua which passes along the ring roads is believed to have been constructed by a Polynesian chief. The Cook Islands are a group of coral islands which also experience volcanic activity from time to time. Coral reefs surround the island of Rarotonga and border the coast around Avarua. The town is located on a low area along the waterfront, but the terrain gradually becomes rocky as the land rises to rugged mountains in the interior. Sandy beaches lie towards the eastern section. It is a true tropical paradise with warm sunny weather and clear blue skies most of the year. Moderate rainfall is recorded throughout the year though the amount is comparatively less from June to October. Avarua houses the Rarotonga International airport, which is located approximately 2.5 miles west of the city. Regular flights are available to Australia and New Zealand. Besides, flights are also available to other destinations in the Pacific. In addition, you can also reach Avarua by boat. The Cook Island in general was settled by Polynesian tribe and a large number of inhabitants are descended from the Maoris – the original tribe of the place. Today, it is a flourishing tourist center and commercial town. The culture of the town thus has a strong flavor of the islands. The festivals of Avarua are strong testament to the culture of the town. The Te Maeva Nui festival is one of the leading events celebrated in town as well as all over the island of Rarotonga. It takes place over ten days in late July and early August. It celebrates the freedom of Cook Islands from New Zealand. It also showcases the culture of the island. Song, dance, float parades, sports and cultural contests like fire knife contest, Maori food festival and coconut husking competition. Another important is the Aztec day celebrated on 25th April with parades and religious services. It commemorates the sacrifice of the residents of the Cook Islands in the two world wars. The Cultural festival week is celebrated on the second week of February. Competition of arts and crafts is held. Finally, the Island Dance festival week is celebrated during the third week of April. Several competitions are held to choose the best dancers for the whole Islands. Aria Te Tonga lies on the outskirts of Avarua. It is the most prominent island Marae site and is a pre European ceremony spot where the chief was appointed. The stone structure can still be seen. The Cook Island library and museum is small but surprisingly detailed with example of handicrafts and artifacts from different period of island history. Sir Geoffrey Henry National Cultural center or the Te Puna Korero houses both the National library and the National museum. The Punanga Nui market is the ethnic market of Avarua where you can shop from a vast selection of mementoes, ethnic foods, costumes etc. The Taputapuatea Marae and the restored palace of the Queen Makea Takau Ariki are located within a shady park but you need special permission to enter. You can also see the carcass of the SS Maitai at the Avarua harbor. This is a trading vessel which ran into the reef and sank here in 1916. There are a number of places to stay in Avarua. Hotels like Central motel, Club Raro, Kiikii motel, Tiare village and Aremongo guesthouse provide good clean, value for money hotel options.